We love our library. Like many libraries across the nation, our library is struggling to maintain the materials, programs, staff, and hours of operation that the community enjoys and I would argue, needs. My family isn’t in the position to be financial supporters at this time, so I’m adding this little “feature” to my blog as a way of showing my support of our library and others that enrich the lives of many. I’m calling this feature “Library Love,” and I hope to share–regularly–the reasons we love our library. 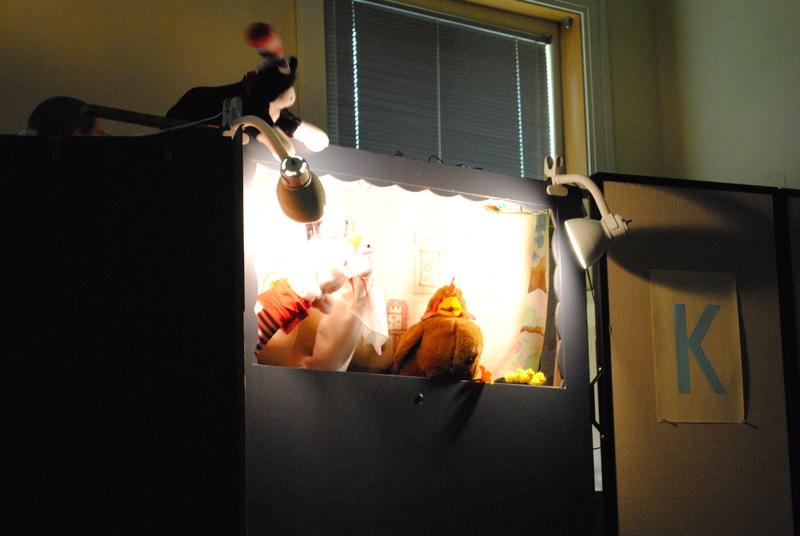 Yesterday morning, my boys and I attended a puppet rendition of The Little Red Hen. Two kindergarten classes were also in attendance plus two other moms with toddlers. The show was cute and funny with some great banjo music that enticed the kids to clap along. If you don’t recall the story, the little red hen plans to make some bread, and her barnyard friends are excited about the prospect. 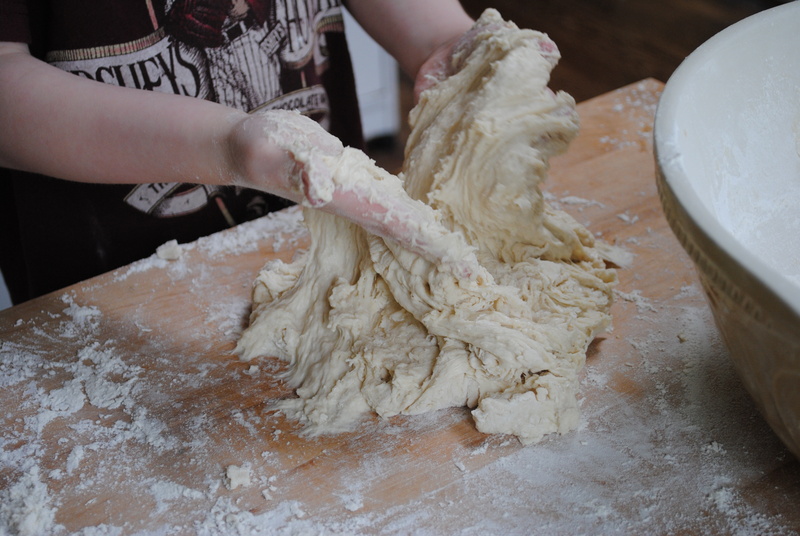 The hen invites the other animals to join in the work of making bread (planting & harvesting wheat, grinding wheat to flour, mixing & raising the dough, and finally baking the bread). For each task, the animals of the farm have “better” things to do, so the hen and her chicks do all the work. Of course, the other animals want to enjoy the warm delicious bread, but the little red hen sticks to guns, so to speak, and refuses to share her bread with the animals who refused to share in the work. A simple, significant lesson. Well, I was pleased to see that a recipe for basic bread was printed on the back of the program. How cute! 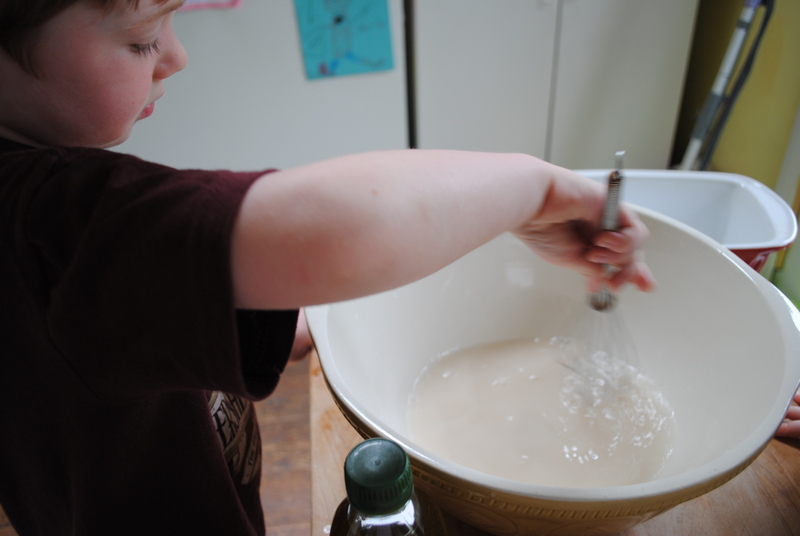 So as soon as the boys and I got home, we pulled out the ingredients and got to work on our own bread. Messy, yummy fun! 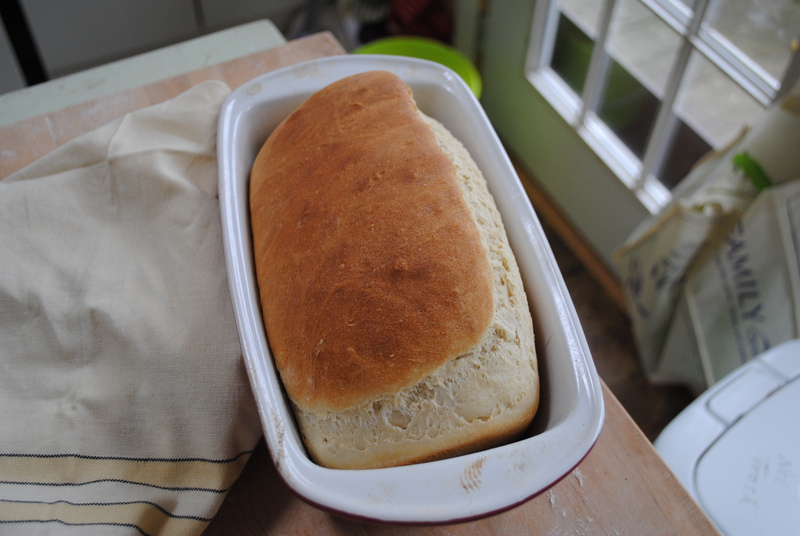 We ate our loaf with dinner, and the house still smells good. So thanks to our local library, we enjoyed a great puppet show, a fun baking experience, and a tasty treat at supper time. Gotta love the library! It’s that kind of a weekend. I am writing in this post, but really am replying to your post about the decision you made to not go back to the doctoral program (although that bread looks fantastic and is making my mouth water just to look at it! )….I’m sorry it took me so long to stop in, I’ve been a little slower in the blog world these past few weeks. But I very much appreciate all the support and love you leave over there, always makes my day! back to your post…what a difficult, yet powerful decision you’ve made. I think that following the heart sometimes leads us down roads that look incredibly different from what we thought that they would, but the mystery, the beauty, the unravelling and unfolding that it has in store for us is so totally worth it…and when something comes to a close, it opens up a wide, wonderful space for something totally new, and maybe even unexpected to come through. Good for you for knowing and following your heart, even when it was tough. That takes spirit and courage. and what fantastic traits to pass on down to your little guys! Thanks, Eliza. I appreciate your words, I’m excited to see what my new path looks like.